PostGIS in an award-winning core part of most of open source webGIS solutions. We are using PostGIS from the beginning of our GIS activity an we collect wide knowledge about it. That’s why we are so proud and happy that cofounder of GIS Support – Michał Mackiewicz – is sharing his knowledge and become a coauthor of “Mastering PosGIS. 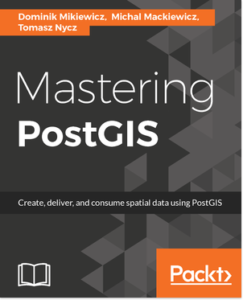 Create, deliver and consume spatial data using PostGIS“. Congratulations to Michał and a rest of the team. Location Intelligence (LI) is a process of finding patterns and trends in Business Intelligence (BI) data joined with spatial data, for better understanding and decision making. Grontmij Polska carried out a water maintenance plan for the Regional Water Management Board in Poznań. The basis for work was a database of sections of rivers from all over the Warta river basin divided into sections according to a methodology agreed upon with the Purchaser. Four people at the GIS department acquired all the necessary data from various sources, and put them into a coherent form. A key part of the entire project was to make an assessment of sections of water, and to propose protection options. From the technical point of view it consisted in describing each section by approx. 30 attributes. Around 20 people worked on the whole assessment. Time was short. Employees at the GIS department had to plan the work together with the estimated risk.